I love light & shadows – they create such interesting patterns if you stop and look at them. I’m trying to be more intentional about carrying a camera with me and actually taking pictures. What a concept, I know. 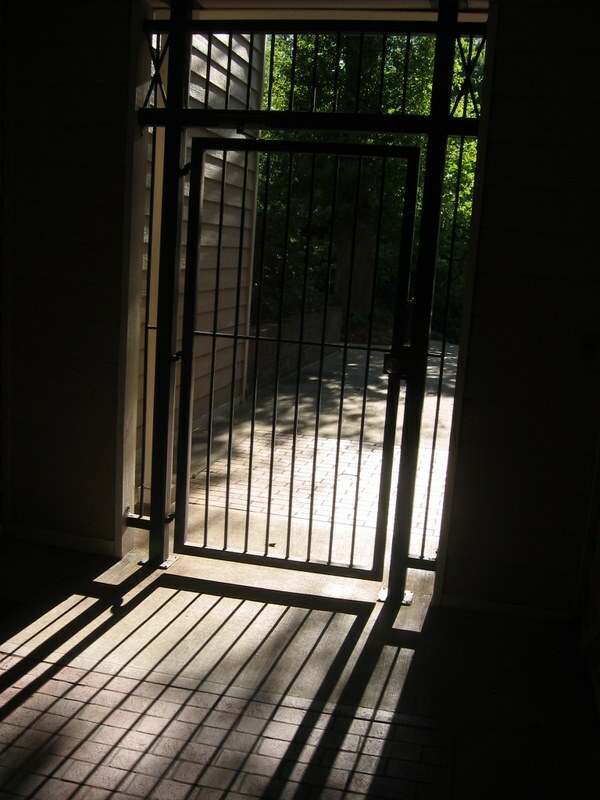 This is one of the gates to our apartment building, facing west. I pretty much only use when coming home from work on my bike, because there’s a ramp leading up to it rather than a flight of stairs. Your post reminds me of the song Shadows by David Crowder. I heard it for the first time a couple weeks ago, and I really like it. I really like your picture too! 🙂 Miss you! It would be fun to use the shadows from the gate as a sort of Stonehenge. What time is it when the shadows fall exactly on the lines of the brick? How much does that lining up move every day? Hmm!